Winter riding in the UK isn’t complete without a hardtail, and there’s no better than the British bred Orange Crush Pro. The alloy frame has custom butting to shed any unnecessary grams, while maintain fantastic strength. A Fox 34 Performance fork puts the control in your hands, and a Shimano 11 speed drivetrain gives plenty of gear range to tackle the mountains. 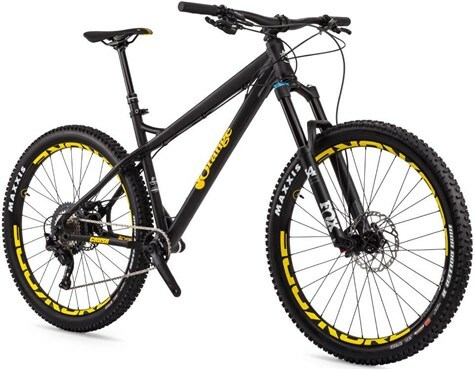 The geometry is bang on point, the rear triangle features a bolt-through axle, giving unparalleled stability to what is already a rigid design. The confident handling 65° head angle along with the Crush’s long top tube design that adds an extra few millimetres means, size for size, a 50mm stem puts the rider right where they need to be for direct input and weight distribution. Short chainstays make climbing as sweet as ever for a long forked hardtail, those stays now reshaped to allow clearance for a more than chunky 2.6 tyre. 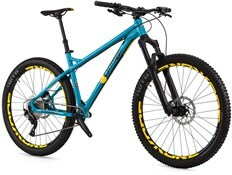 I moved on from a Scott Carbon Hardtail to this Crush Pro, and it is a superb bike. Just got back from a 2h ride, and it was more enjoyable that my Scott. The Crush makes you braver, it delivered every time I asked it and I had no annoyances. 10sp is just fine, I did my usual route through trails, hills and very, very mild DH and it soaked it all up effortlessly. The dropper post is superb, I thought these were a gimmick but used it a lot - very handy! Great, great bike - very happy with purchase. Very solid bike with all you need. Absolute beast of a hard tail, not far behind my full suspension YT on the trails. Usual build quality from Orange, a big thumbs up from me! After owning a GT Aggressor, I felt that I needed an upgrade. As good as the aggressor is, It lacked the performance and quality I needed for the terrain around the Pennines. This step up is like a completely different beast to tame and I absolutely love it, it chews the terrain effortlessly, and the Matt Black & Yellow is perfect pairing, It looks awesome. Such a sick bike, looks the part and feel so nice when your on it, couldn't get on with a full sus so purchasing this was definitely the best choice.